Phew! 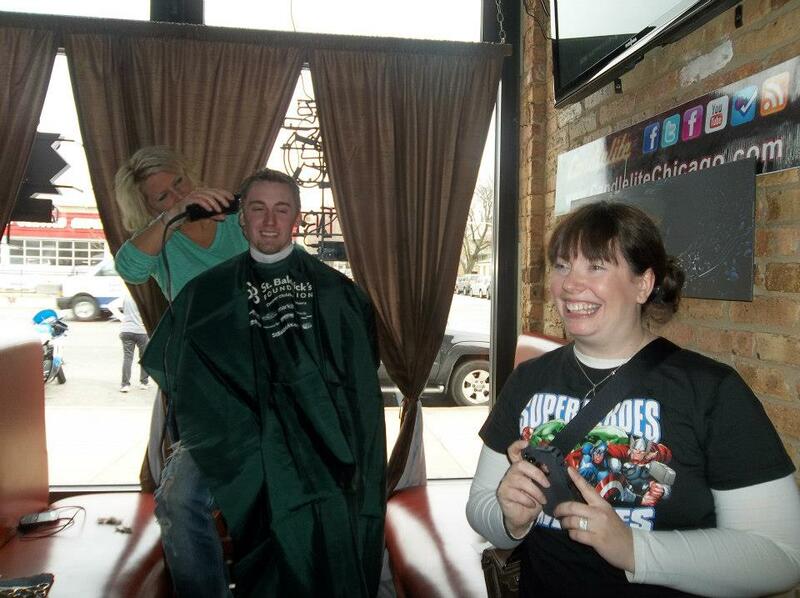 I feel like I am finally recovered from an amazing weekend in Chicago where we attended a Shave-A-Thon for Charity #3, St. Baldrick’s Foundation. I feel like I had jet lag. Only…I didn’t take a jet. I guess it was all of the nerves and excitement and the anxiety of making sure I had everything ready to go. It was probably also the combined seven hours of sleep I got that entire week leading up to it 😉 But I was so excited!!! And how could I not be?? Together, we raised well over the $100 goal that I set for all of my charites. We raised $600.00 to be exact. Dayum. NOT. PROFITABLE. That makes me sick. These are kids we’re talking about here. Most of them are not even old enough to drive themselves to appointments or sign off on medical documents without a parent or guardian being present. But they are not profitable, and their lives are not worth it. If only they were thirty years older…only then do the pharmaceutical giants think they deserve a shot. If you follow my Facebook page, then you know that I was mostly inspired to choose this charity because of a little girl named Donna. 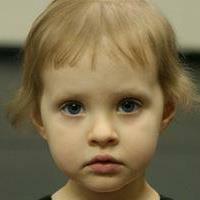 Donna Lu Quirke Hornik~ just one of (too) many faces of pediatric cancer. I first read about Donna a couple of years ago, when her mom published a blog detailing Donna’s 31 months of cancer treatment over a period of thirty one days. 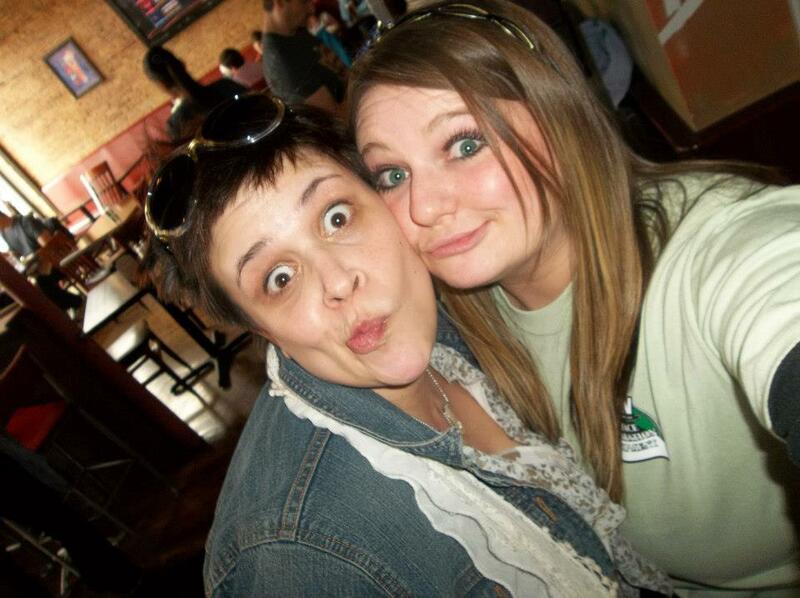 Donna was only 20 months old when she was diagnosed with an aggressive brain tumor, papillary meningioma. She died when she was four years, two months, four weeks, and one day old. But more important than those 2 moments in her life were the two and a half years in between where Donna chose happiness and fun and hope and tantrums and love and dancing and sassiness and being a big sister, everything that a child her age should be choosing. I was also inspired to choose this charity because of Donna’s parents, namely her mom Sheila who writes the amazing blog Mary Tyler Mom. 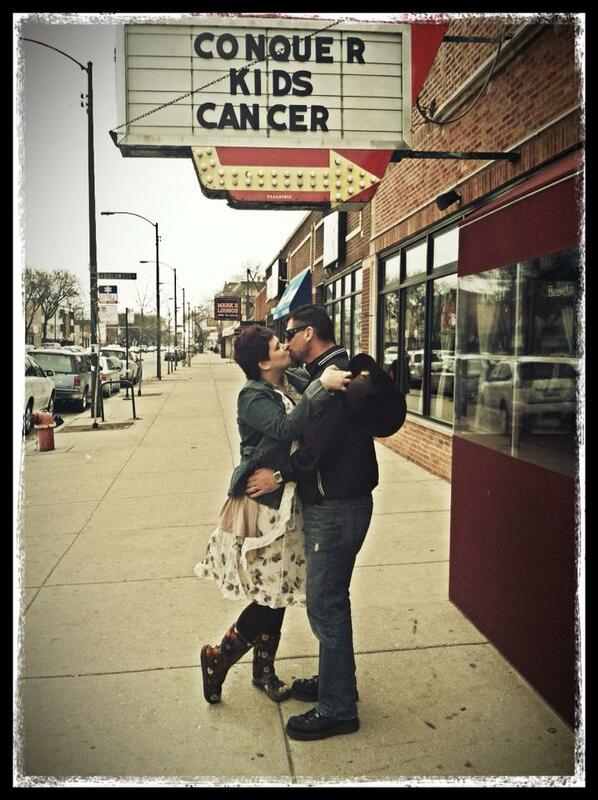 If you haven’t read Donna’s Cancer Story on her page, I encourage you to start here http://www.chicagonow.com/mary-tyler-mom/2011/08/gold-is-the-new-pink/. Donna’s mom and dad could have crumbled, but they didn’t. They could have holed up in their home, locked all the doors, turned out all of the lights and never come out again, but they didn’t. THEY CHOSE HOPE. They’re still choosing hope. 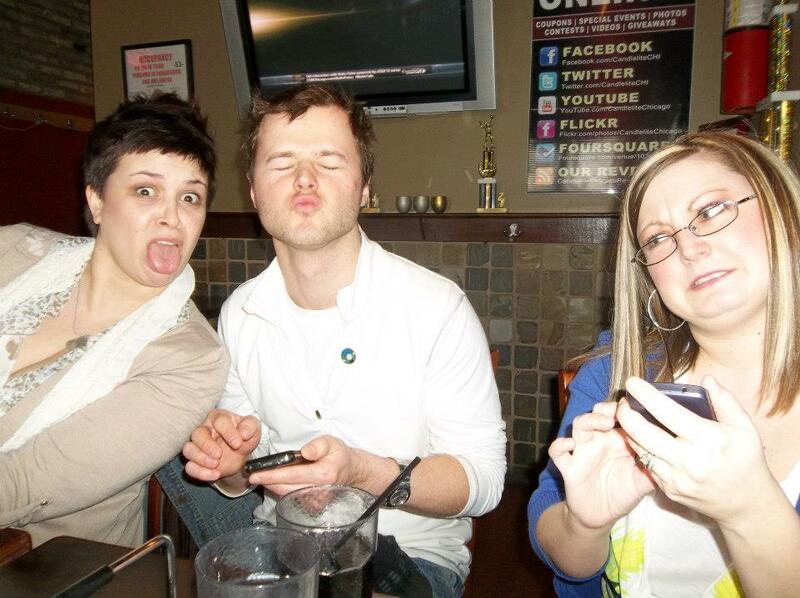 And they are the coolest people. 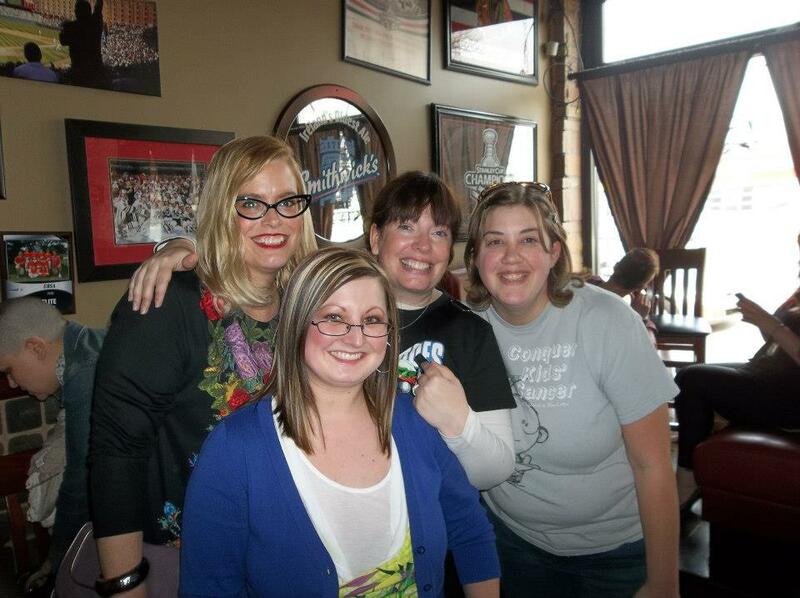 I met them this weekend, along with their little boy Jay, Donna’s younger brother. They smile and laugh and joke and play and comfort. I also got to meet some of my other favorite bloggers like Katy from I Want A Dumpster Baby, Karin from Pinwheels and Poppies, Chris from From The Bungalow, and one of my fave girls Jeanna from My Children Think I’m Perfect who SHAVED HER HEAD BALD after raising $2,041.00 for St. Baldrick’s!!! Jeanna and her hubby Doug rode with me, my hubby Greg, my sister Ellen and her boyfriend Jake to Chicago. 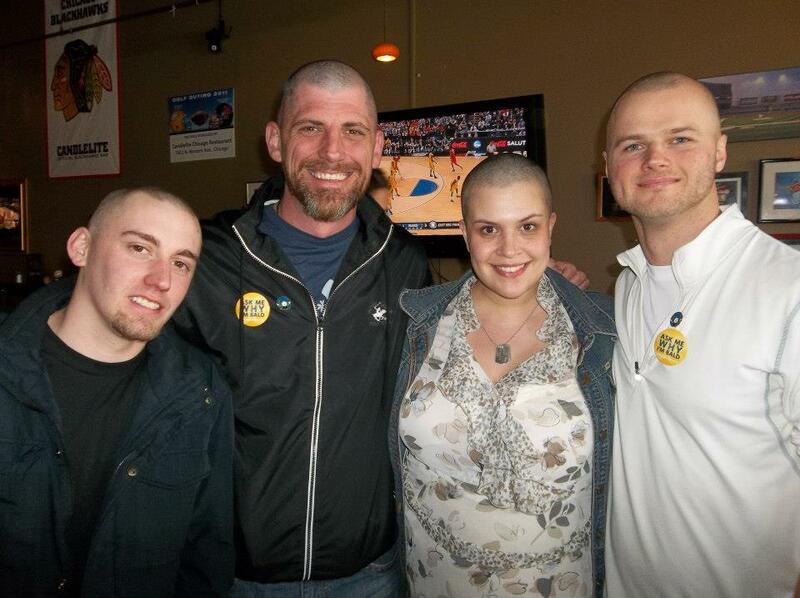 Doug, Greg and Jake also shaved their heads in support of pediatric cancer awareness (and so did Jeanna’s young son and tween daughter! They are super brave, especially with how nasty kids can be these days). Although we spend plenty of time together in virtual life, it was our first time ever meeting in real life and we had the best time! Thank God, because six hours there and back is a looooooong time to travel with people if you don’t mesh 😉 We devoured these awesome loaded tator tots and mingled with celebrities and spent all day in a room full of courageous shavees, ranging in age from 11 to 89! 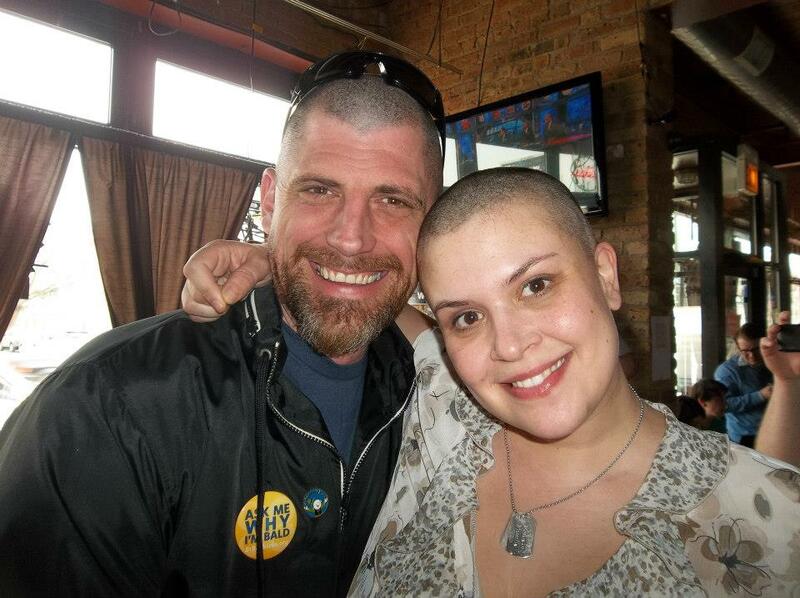 All together, the Chicago Shave-A-Thon event raised over $40,000.00!!! We will definitely be going back next year, so start saving your pennies…I’ll be coming after ’em! Thank you so much to everyone who donated to Charity #3, especially my Aunt Karen and my Uncle Bruce, who had their company BW Manufacturing (www.bwmanufacturing.com) generously match $250.00 of the money raised!! Because of people like them and because of people like you one day there WILL be enough money for research and medication and prevention and awareness and cures. You just gotta keep choosing hope. Team My Sudden Attack of Shaved Hair! 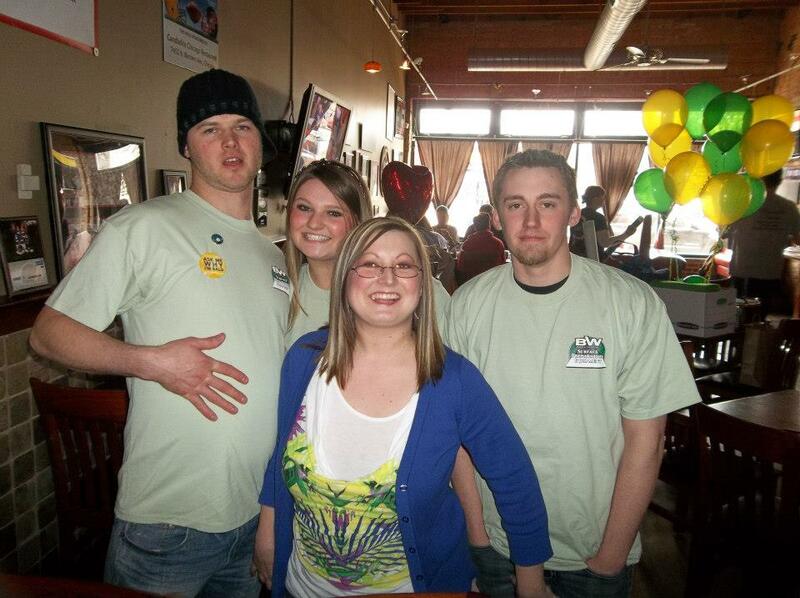 And no, I am not REALLY grabbing anyone inappropriately….at least, I don’t think I am. 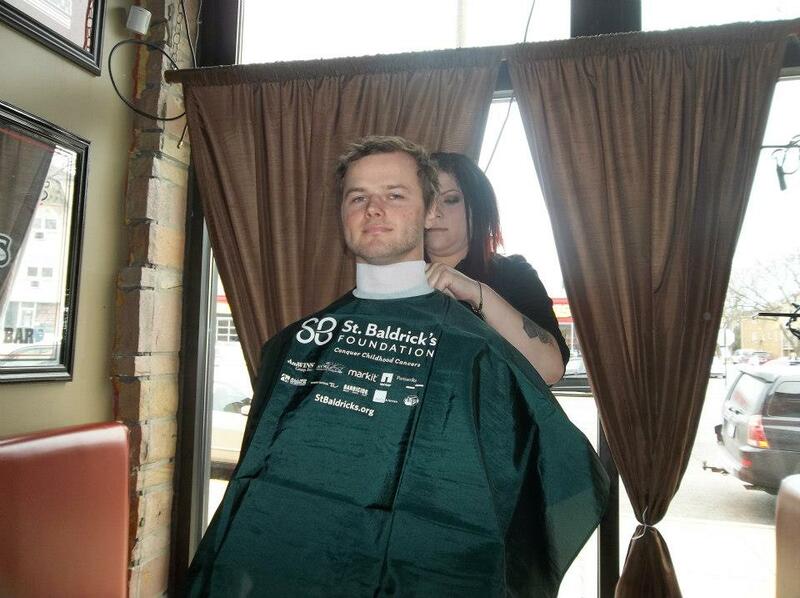 Jake was one of the first shavees to go, while Sheila from Mary Tyler Mom cheered everyone on. …and came out like this. 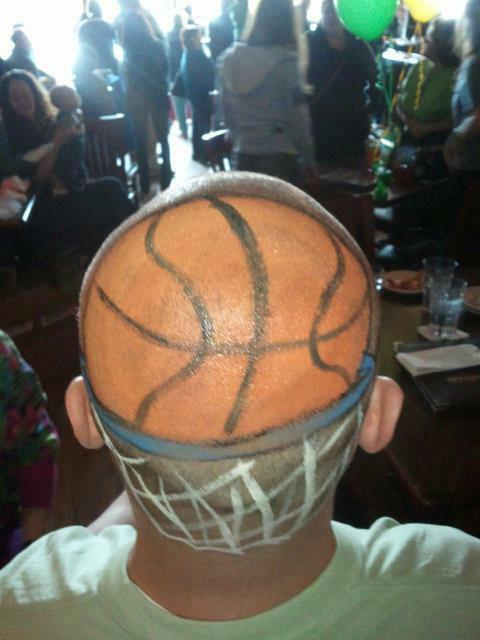 March Madness dork! Look at the company I’m forced to keep. 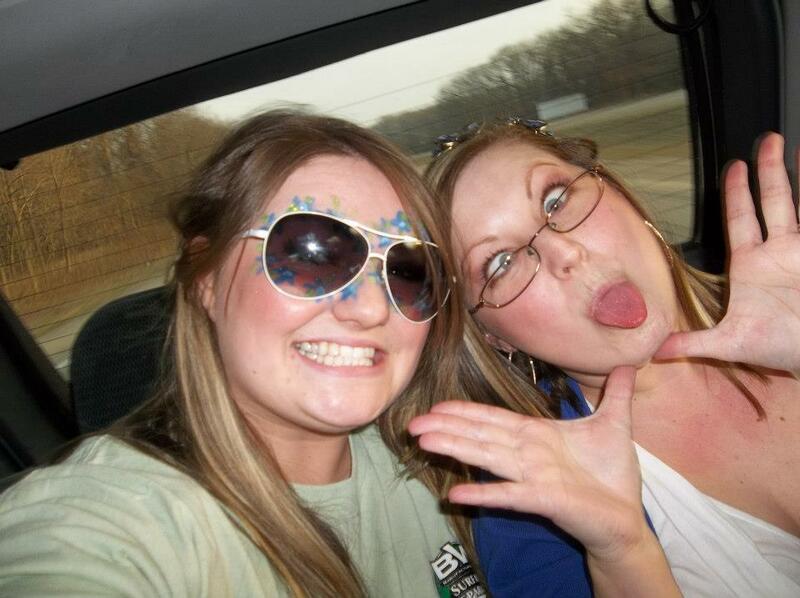 I’ve gone stir crazy in the car with my seeester! Some of my faves 🙂 Left to right ~I Want A Dumpster Baby, Mary Tyler Mom, and Pinwheels and Poppies. Look them up on Facebook too! I’m insanely jealous! I’d love to meet you and all of them as well. Such a cool and WORTHY experience.